We ship within 24 hours on all in stock merchandise. If an item sells out, backorder notices will be sent, and the buyer given a chance to cancel the order. Most backorders ship within 4 days of order. Satisfaction guaranteed. If you are not 100% satisfied, merchandise can be returned for exchange or refund. If not satisfied, customer may return merchandise for full credit within 30 days. Any damaged or defective items must be reported within one week of receiving the order. We will ship the replacement free of charge or issue a credit. All damaged or defective merchandise must be returned in its original packaging with copy of original receipt. Thanks for visiting our Atomic Mall store! We have been selling online for several years. Our main goal: to treat each of our customers as if they are our only one! Your satisfaction is our top priority. Every so often we go nuts and start making these bundle specials at huge savings. 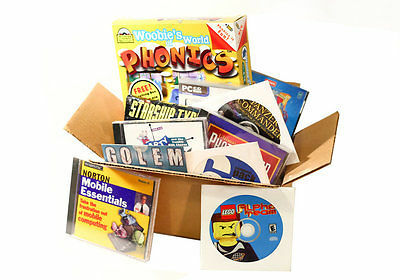 This month we&apos;re featuring our Box -O- Software, with 10 Brand New CD-ROM software titles, still in their original sealed packaging. Many originally retailed at $29, $39 and even $49.95 now yours for only $1.50 ea. These are random lots, and at this price we cannot allow specific requests, but you can expect to find a nice assortment of NOS (new old stock) software for PC/Windows and occasionally some hybrid titles that will work with Macs too. Some titles will arrive in their original jewel cases, while others may be in retail boxes, DVD-style boxes, or sealed Tyvek sleeves. Most will be compatible with Windows 95/98/XP & above. Some games may require legacy mode to run inside Windows 7, 8 or 10. Because of the nature of this liquidation sale we cannot guarantee compatibility with any specific computer, and no returns will be accepted. Quick, same day shipping on all orders for payments received by 3pm! We only have a LIMITED NUMBER of these liquidation lots, so order soon!